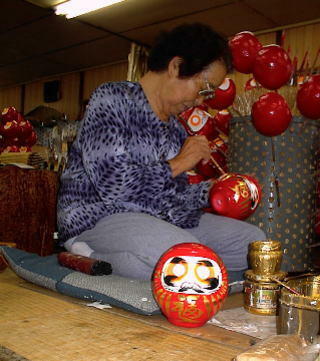 Ohmi Daruma have been made since the Taisho period by Mr. Terai of Notogawa. The Temple Kajuu-Ji 勧修寺（かじゅうじ） functions as Youth Hostel and Local Museum. CLICK on Drawing for enlargement!
. Omi Hakkei 近江八景 Eight Views of Omi . clay dolls from tradesmen of Omi . . There are many examples at Kodomobeya. Great Link for many Papermachee Dolls. 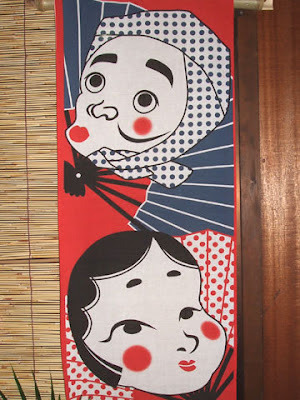 This O-Fuku Daruma comes in various shapes.
. Tenugui 手ぬぐい　Small Towels .
. . . CLICK here for O-Kame Photos ! is another name for O-Tafuku. A goddess of mirth, mentioned already in the Kojiki. 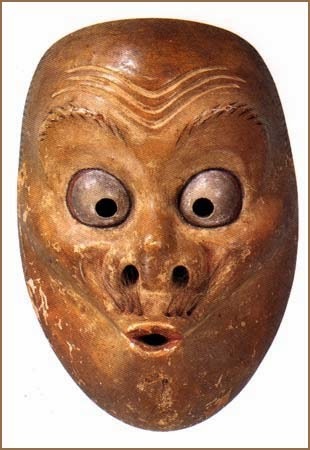 The first masks of O-Kame where used for Kyogen performances and have maybe shown the ultimate of female beauty. She danced in front of the stone cave where the sun goddess had hidden. Her lascivious dance made the goddess laugh and come out to this world again.
. . . CLICK here for 天鈿女命 Photos ! 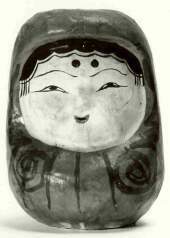 Later she changed into a funny round face, sometimes identified with the cheap courtesans of the Edo period. 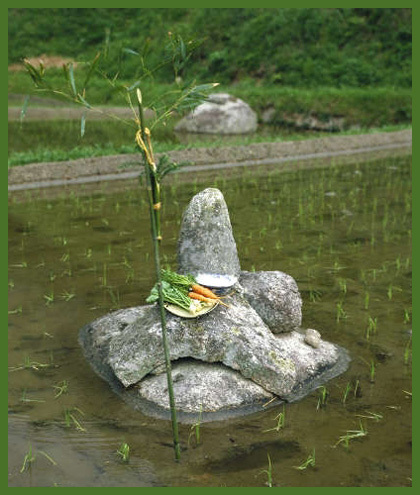 is the goddess of dawn and revelry in the Shinto religion of Japan. Her name can also be pronounced as Ama-no-Uzume. The Great Persuader, The Heavenly Alarming Female. 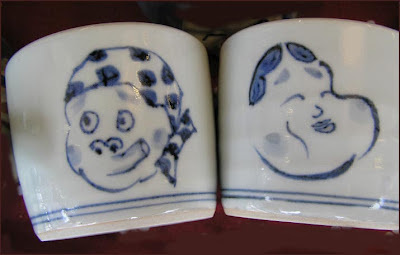 Anywhere you go in Japan you are likely to encounter the plump, smiling image of Otafuku. 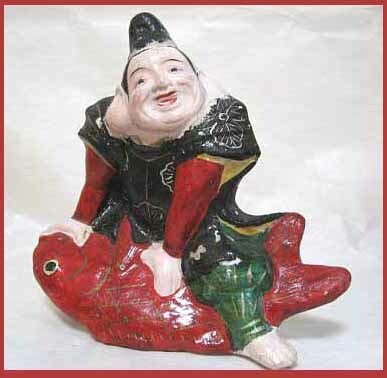 Author Amy Sylvester Katoh traces the roots and folk beginnings of this mythic figure, showing Otafuku's many delightful identities, and providing a magical glimpse into this charming character who has become a national icon. With a mixture of poems, photographs, anecdotes, and stories, she presents a veritable treasure chest of surprises that is sure to enchant readers.
. tsurushibina つるし雛 / 吊るし雛 small hanging hina dolls . 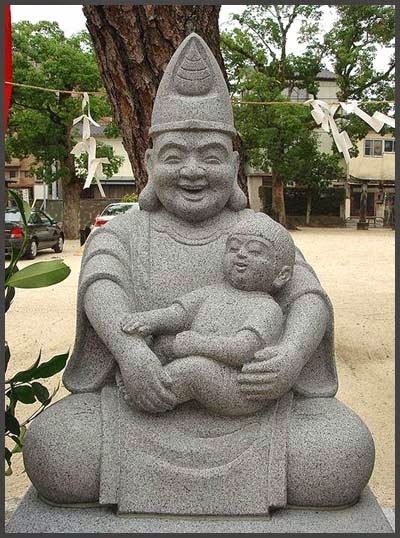 With the wish to bring a "lot of luck" (ta fuku) to the child. Mask of O-Kame, click for more photos ! 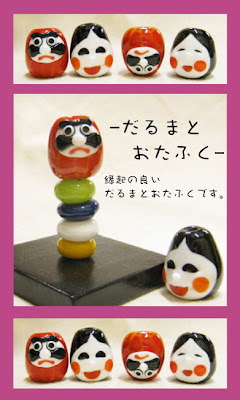 okame-ichi おかめ市（おかめいち） maket for masks of "o-kame"
okame おかめ【阿亀】 is a woman with a flat, round face. 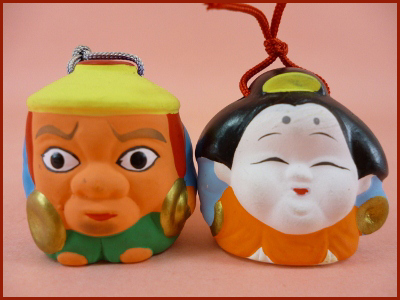 This is an auspicious item for happy couples, together with the kumade sold at the fair. With this name, her husband is Hyottoko ひょっとこ. 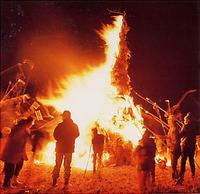 This is short for Hi Otoko 《「ひおとこ（火男）」, a man in the fire. His face is distorted like a man who uses a bamboo stick to blow into a fire. 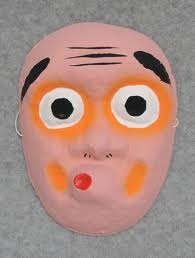 This mask is often used for comical rural Kaguya dance performances at the local Shinto Shrine. 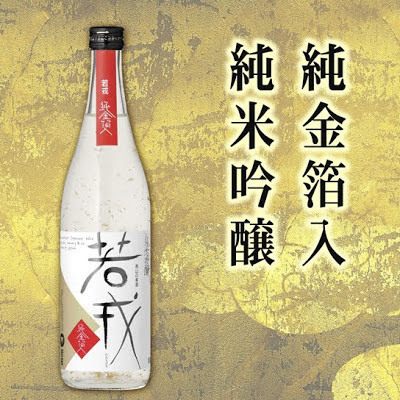 In Iwate Prefecture, there is a myth about the origin of Hyottoko. In that story, there was a boy with a bizarre face who could create gold out of his belly button. When someone died in a house, you would put the mask of this boy at the top of the fireplace to bring good fortune to the house. 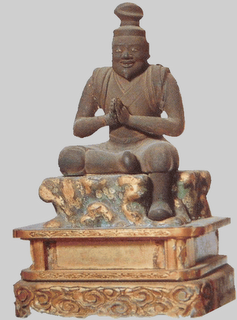 The name of the boy was hyoutokusu (ヒョウトクス). This is considered as one of the possible name of the origin of Hyottoko. 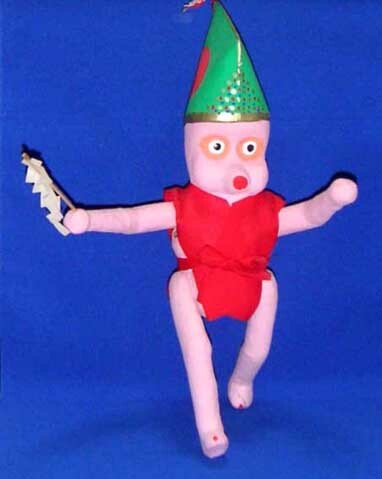 Hyottoko appears in traditional dance Dengaku (田楽). He plays the role of a clown. 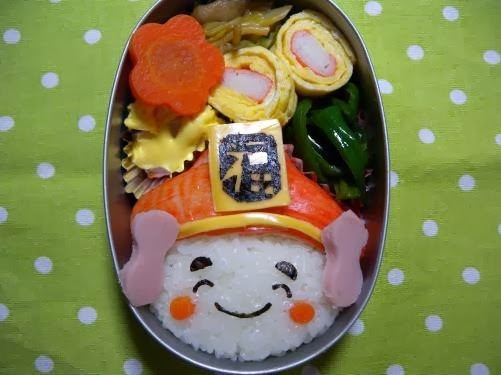 Here O-Kame comes in an advertisement for Natto, fermented soy beans , with O-Kame san.
. . . CLICK here for 達磨おかめ Photos !
. 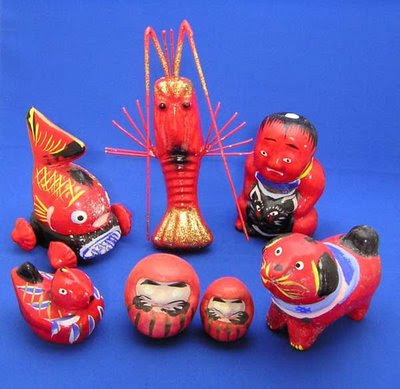 Choosa tsuchi ningyoo 帖佐土人形 Chosa clay dolls .
. Men, omote 面 masks of Japan .
. Chopstick rest 箸置け hashioki . 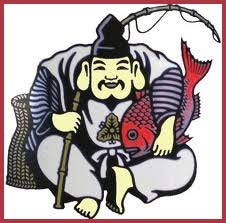 Usofuki (or sometimes, Usobuki), is the smallest of the characters, representing the meaninglessness of the human condition in its impotent apex. Its eyes look surprised, but it is unable to scream or roar; it can only whistle, discretely, cowardly, inconsequentially. 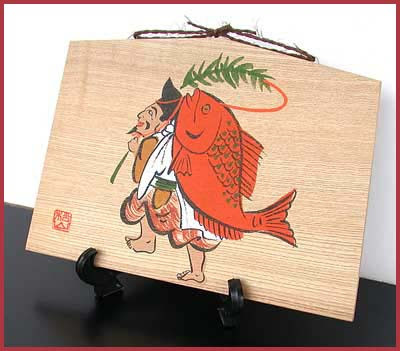 Hence, Usofuki also being used as the representation of insects and small animals. Hence, again, the origins of its own name: "uso" meaning lie, and "fuki" meaning to blow, to whistle. As a representation of the human condition, it is exaggerated and comedic. 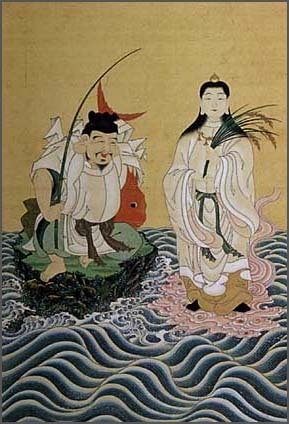 As an esoteric principle, it is precise in the form it depicts the action of man and the turns of Fortune: tragedy arising from the whisper of a lie.
. choroken ちよろけん / ちょろけん　Choroken . A street performance custom 長老舞　in Kyoto and Osaka. 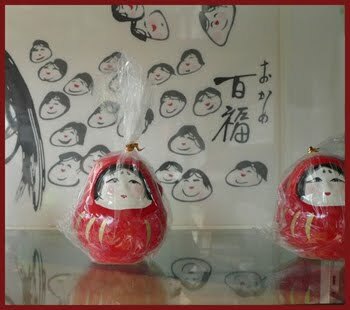 This is a special papermachee Daruma from a store near the temple of Kawasaki Daishi. 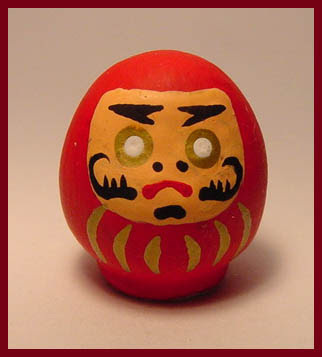 This Daruma was also called "Daishi Daruma". 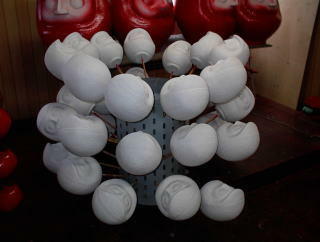 On the following link you can see most of the process of making this Daruma. The present maker, Shimada san, is in the 14th generation of making this doll. The form has to dry. Now the face is painted. It takes about one week to finish one doll. Japanese dolls, traditional crafts well known for their delicate and graceful beauty, are popular souvenirs for overseas travelers. Did you know that nearly half the number of Japanese dolls sold in Japan are manufactured in Saitama? The production of dolls has been going on since long ago in Saitama, which has been blessed with plentiful paulownia wood as material for dolls and water of good quality to dissolve the white pigment used to paint dolls. 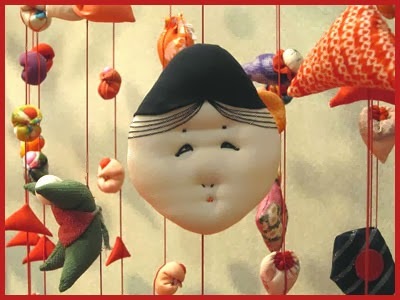 Dolls are produced in Iwatsuki, Kounosu, Tokorozawa, and Koshigawa in Saitama, among which Iwatsuki and Kounosu are the largest production areas; dolls produced in these areas are famous nationwide. The main streets in town are lined with doll manufacturers, which look as if they were doll-dedicated streets. People visiting these places will find that each store is crammed with dolls manufactured by artisans who put their hearts and souls into their creation. 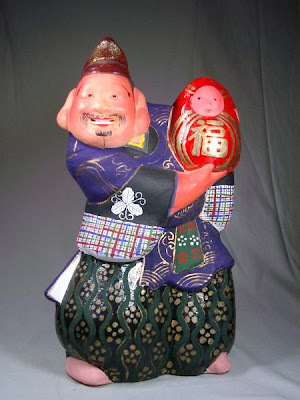 Iwatsuki and Kounosu are famous for their dolls' festivals as well including the Bikkuri Hina Matsuri (lit. Surprise Japanese Doll Festival), which features Japan's highest tiered doll stand, and the Iwatsuki Festival, which features pleasant Manto Mikoshi (a lighted portable shrine) and doll costume parades. 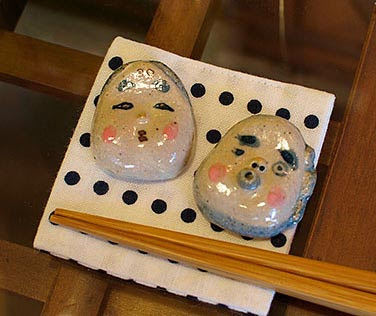 The two areas of production hold these doll-related festivals to boost the production of traditional dolls in Saitama. 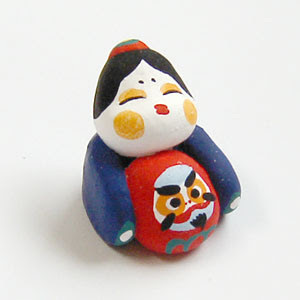 Bushuu Daruma is also a type that comes from Koshigaya in Saitama prefecture. The one on the left in the picture below. 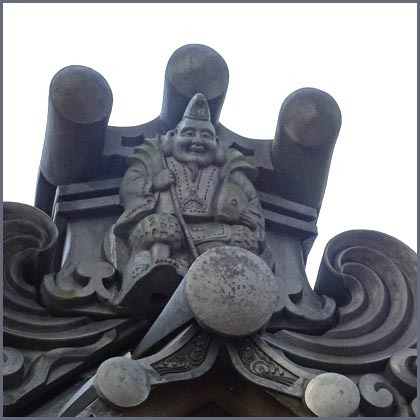 The belly had no inscription in the older days, but now the character for good luck, FUKU, 福, is inscribed. 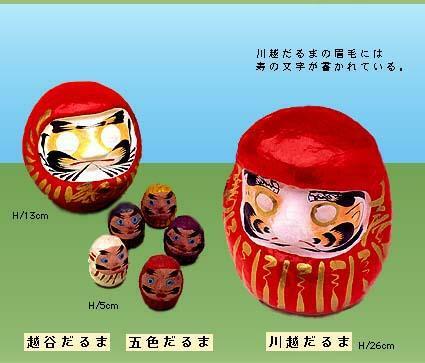 In the last few years, the production has risen to more than 50000 pieces a year, mostly sold at the great Daruma fairs in Kawasaki, Shibamata Taishaku and other markets around Tokyo. 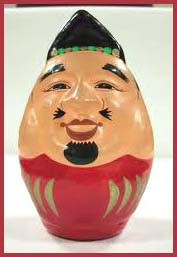 But this Daruma is loved from Hokkaido to Kyushu by all Japanese. 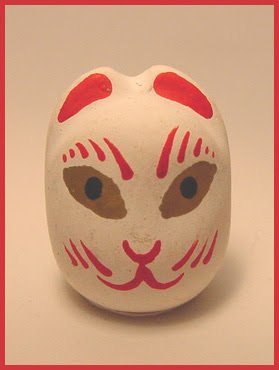 Apart from Daruma dolls there are foxes, Tengu masks, and many others. Musashi DairokuTen Jinja 武蔵第六天神社 in Iwatsuki.
. Dairoku TenJin Sha 第六天神社 Hanno town . made from forming clay into doll forms. 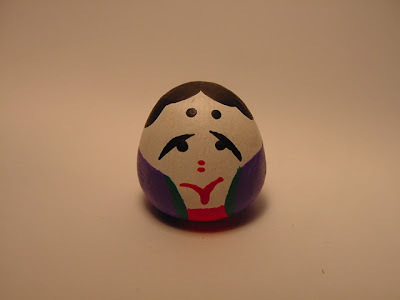 His Daruma are more white and the nose is more protruding. 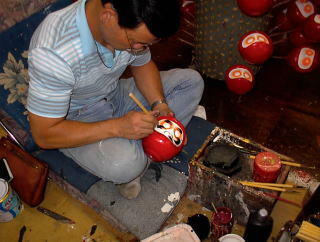 He makes Daruma together with his mother and his wife. including the ones mentioned above. Funado Hariko dolls 船渡張り子, made in Koshigaya town since the Meiji time. 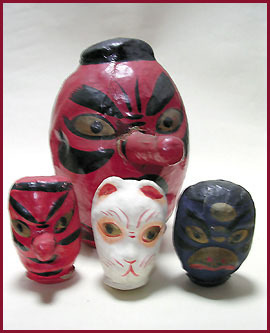 They also made foxes, Tengu and tigers.
. Sanbasoo　三番叟 Sanbaso Dancer .